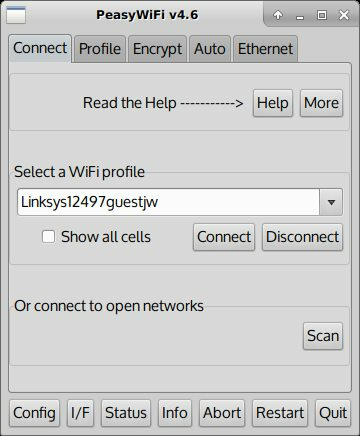 peasywifi after scan only find 2 networks and don't mine ? PWF has two "Scan" buttons. One is on the main Connect page and just finds open networks. The other button is on the Profile page. Are you using the right one? How close are you located to the wireless router? Yeeees correct,i was not using the right scan,the scan that work for me is the one on the profile page. Great thanks to you rcrsn51. Now my next goal to make work this wifi chipset in more recent puppy like bionicbeaverpup or slackopup,is it possible ? You would need a kernel upgrade. Ask for help in the bionicbeaverpup section. Frisbee would do it too, just disable ethernet because one fights the other. Oh, well, ok then: Bark Bark !! Thx for peasy-wifi. Really great tool! Question: Is there a command to run only the "Scan to connect to open networks", without first loading the main window? In task manager, i see `sh -c SCAN &`, but that does nothing on a command-line. Issue: On DebianDog, i had to delete my stored connection, because it always failed to connect-- i could only connect by restarting my wifi extender. However, when i instead connected only using the 'scan open networks' tool, it connected every time no prob. But that's not the main reason i want to bypass the main window. It's just simpler usage that way. Connecting via a saved profile should be exactly the same as connecting on-the-fly via "Connect to open networks", except that the latter may have "woke up" your network by doing an initial scan. Or it may have something to do with how your range extender works. There is no way to jump directly to that screen, just to save one mouse click. [Edit] You could try building a profile that uses the range extender's BSSID instead of the access points's SSID. may have something to do with how your range extender works. it's not just about saving a mouse click. I'm making a distro to share with non-geek friends and my mom. I'm trying to simplify everything. Your config screen will just confuse them, and they will never need it. Your scan-window has all they need. They can always get to the config screen from the menu, if needed. Showing an entire config interface, when you're just trying to connect, is TMI. i think i am. I connect to the extender, not to the router. Is that what you mean? Would that suggestion apply if it connects successfully on first connect? cuz it does. Click the Show all Cells box to see the bssids. hrm, tried that. I don't see anything different. Now testing on a different Stretch. I'll report back. I don't understand. Are you talking about the Config button at the bottom left? to save RAM on a low-ram machine, i don't run your system tray icon. It's a nice-to-have eye-candy, but not essential. I also removed the ram-heavy notification area. so now, to connect with Peasy, i run peasy-wifi connection manager. That brings up the config screen. Btw, on an OS i made with mklive-stretch, your auto-connect is working. Maybe was a temporary glitch on my extender, router, or maybe a prob with the other OS. That brings up the config screen. Do you mean the main screen under the Connect tab? The objective of PWF is to build a collection of profiles that give you one-click connection to your regular access points - home network, library, coffee-shop, wireless printer, etc. I don't understand how hiding that screen makes the program less confusing or easier to use. Other connection tools will show you all the available APs, all the time. PWF does not. Your multiple tabs and many buttons and controls and tabs will bewilder and intimidate a non-geek. Almost none of it is needed for day-to-day computing. That's awesome, but i thought the point is no-clicks, not one-click. If the profile is saved and set to auto, then it connects on boot automatically without any clicking. Awesome! If it's not already saved, then your scan-for-open-hotspots window is all that's needed to find and connect to a new hotspot. Awesome. No need to look at the config screen. But, would be more awesome if, in addition to the "Save" button, had a checkbox "Auto-connect on boot". Then non-geek users never need to see your intimidating config screen. I noticed that, once the scan window opens, i can 'quit' the config screen, and the scanner window keeps running. So they're clearly separate processes. If i open your scanner dropdown, then there too i will see all the available APs. 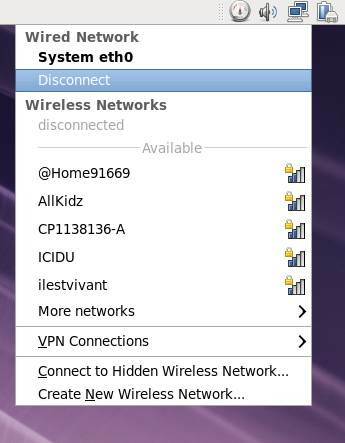 Network Manager, for example, gives a popup which directly displays all available hotspots. You can connect to one by clicking it. Config stuff is hidden away (where you can get to it if needed). Less noise, fewer clicks. I don't have to go thru multiple windows to get to the hotspots. I don't mind seeing the list of all AP's all the time-- that's handy! I do mind seeing all the config stuff all the time. You don't give other people enough credit for being able to learn a different user interface. My 85 year old mom doesn't need or want to "learn a different user interface", and I'm not going to expect her to. She just wants to quickly and easily connect to wifi, with a minimum of effort and distraction, and check her gmail. A quick-connect scan window is all she needs.